​Thanks to Daisy troop 82284 for bringing in donations and helping to stock the shelves. People helping people. The Pantry received 80 turkey dinners from Paul Wahlberg and Alma Cares on November 20th, We can not thank Paul enough for his generosity. The donation was coordinated through the Greater Boston Food Bank. Also a big thank you to our drivers and volunteers for putting the order away. Happy Thanksgiving! On July 25, 2018, the Greater Boston Food Bank presented a check to the Hanson Food Pantry to be used toward the purchase a new truck. The truck is used for food pick up to the various sites that donate food. Every year the Greater Boston Food Bank offers grants to their partnering agencies. The grant was written by Jason Thomson, a Board member and Heather Arrighi, a volunteer. We are grateful to the Greater Boston Food Bank for the choosing us as one of the grant recipients. Also to McLaughlin Chevrolet of Whitman for their generosity and help in purchasing the new truck. 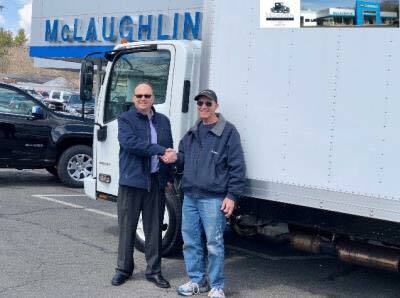 ​Our facility manager, Wayne Thomson picking up our new box truck at McLaughlin Chevrolet in Whitman. We thank McLaughlin for all their generosity, guidance and help. Also we would like to thank the Greater Boston Food Bank for awarding the Hanson Food Pantry one of their capacity grants to help with the purchase of the truck. The new truck will allow us to pick up larger food orders. 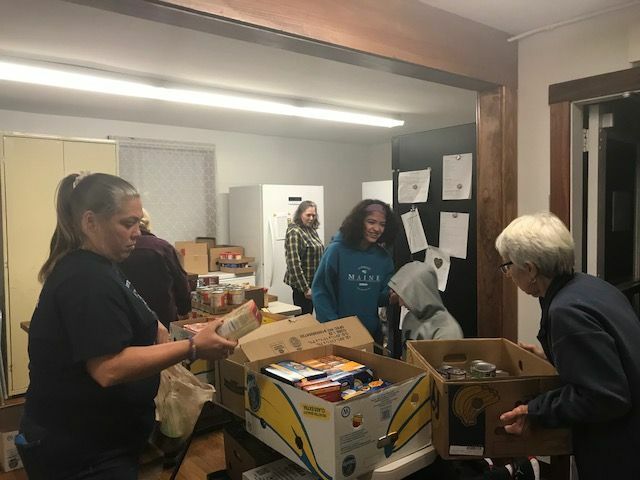 It takes many to help us serve people in need, the generous people of Hanson, the many businesses who are always there for us, our dedicated volunteers and so many more. A big shout out and thank you to the Hanson Boy Scouts of Troop 34 for a very successful food drive. The Pantry benefitted with a food donation of 999.2 pounds and a cash donation of $273.51. Awesome job! Thank you also to our fantastic volunteers that were at the Pantry to accept the donations. Important message: The Greater Boston Food Bank is looking for a new location to distribute food to local food pantries, including Hanson. The GBFB is seeking someone to donate the use of loading dock space, preferably with six commercial truck-height doors, each Wednesday from about 7 a.m. to 1 p.m. Anyone who is interested should contact the GBFB at 617-427-5200. Hanson use to pick up our orders in Bridgewater, but now have to travel to New Bedford. Check out this great PSA announcement done by our Director Sharon Kennedy. 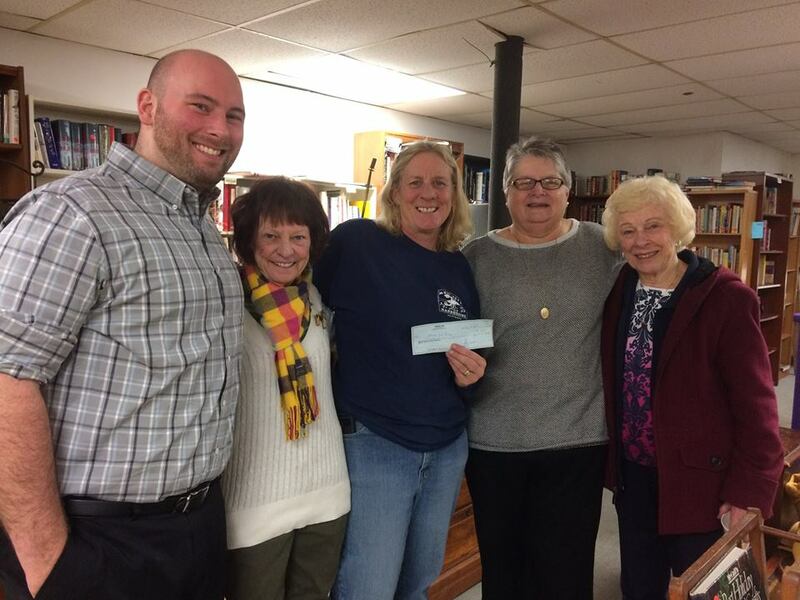 Thank you to Good Deeds/Dirty Deeds in Pembroke for the generous cash donation. We are so grateful for your support. A heartfelt thank to everyone who helped make our "Pack the Pantry Auction" a success. We so appreciate everyone who donated items, their time, their space to store the items, and donated the space to hold the auction. And of course all who attended. Thanks again. 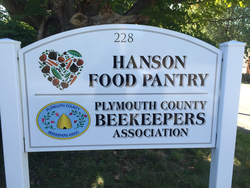 A big thank you to the Plymouth County Beekeepers Association for our new sign. "Thank you Shaw's for the Summer of Giving Food Drive, which will help us replenish our donation supply and help feed those in need." A big thank you to the owner, Kristine Lewis Thayer of The Attic Fanatic wonderful event. The event raised $250. for the Food Pantry. Thank you everyone who participated, a fun time was had by all. A big THANK YOU to Phil Johnson for hosting a Boot Camp last Saturday at the Hanson Town Hall Green with proceeds going to the Food Pantry. Phil raised $170. and 10 pounds of food was donated. Phil is the owner of Just for Your Personal Training in Hanson. Click on the link below and learn more about us. Thank you to everyone who stopped by to say hi on June 7th at "Hanson Day." Thank you to everyone who helped make and or contributed to the beautiful baskets that were raffled off. Thanks to everyone's generosity the Food Pantry made just a little over two thousand dollars. Great time was had by all. The Pantry would like to thank Ferry's Automotive who made a great basket for us. Shaws in Hanson donated a large Italian Basket, as did Stop and Shop in Pembroke. The Pantry would like to thank the following businesses that donated gift certificates for our raffles: Sully's Barbershop, Shepherd's Service Center, Dominoes, Damiens, The Eating Establishment, Neet Nails, Dunkin's Donuts, Dave's Automotive, Spiros II, Mikes House of Pizza, Bryantville Pizza Kitchen, Hanson Grain, Wyman's Nursery, Hanson Tire World, J&R's Indian Head Pub, Candy Jar, Club X Fitness, Stop and Shop, Tedeschi's, Hanson Hobby, Modern Barbershop, Hanson Ace Hardware, Olde School Café, Monponsett Inn, Venus Three Restaurant, Cafe' Deli, Hitching Post, Connie's Restaurant, Pembroke Liquors, Meadowbrook Restaurant, and Heidi's Hollow. Opening ceremonies of the new home of the Hanson Food Pantry on January 10, 2015. The Pantry is now located at 228 High Street in Hanson, Mass, at the site of the old Plymouth County Hospital. Volunteers, headed by Paul Nicol, a Hanson resident worked 3 1/2 years to get the facility ready for the Food Pantry.